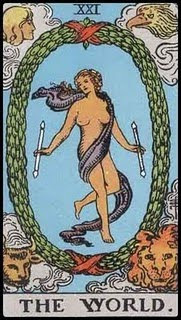 in the contemplation of the symbols of this tarot key we are still given many other points of reference and inexhaustible allusions to gnostic thinking, i dare not say doctrine. This time i’d like to bring further attention to the Keywords of balance , tau meaning cross, and dance. As our female who is veiled dances in the center of the card , i am reminded that carl gustav jung said that the modern mandala has removed god from the center of the spiritual way of life. This is apparently what the androgynous figure is , it will be carefully noted that she is not a god. Rather she is a picture of the Self. Her hands hold two wands usually black the other white, The symbolism is very similar to that of the eastern Tao yet the wands also can represent the dualistic nature of the cosmos as each is pointed at the above and below positions. Here again CG Jung talks to us in his Seven Sermons to the Dead of the inseparable duality of the creator of the universe. As mentioned in another post, this apparent balancing of the spheres of black OR white have turned into black and white. after a long process of him creating and making lots and lots of angels and demons, they all started working in unison as a new world order (LOL) and had one goal, the fashioning of a creature to worship them, a unequal to allow them to gain power and rule the cosmos. Sophia had other plans, by allowing her son Yaldabaoth to blow into the modeled being she enabled its life. but the victory is when the instructor has been revealed as a serpent. I really love the logic see if you like it too. ? creates everything even a creation to spread its story, ( EVEN SNAKEs) then it allows this creation to , in all the activities it can do to NOT eat of the knowledge tree ( SOPHIA) because he knows that he isn’t alone there is one thing adam and eve cant do , which is wake up, therefore like a arch villain his plan is foiled by the foundation of the statement, eat from any tree. but not that one. what kind of omnipotent thing would allow such a diversion from its perfection , unless of course there is a mathematical anomaly and the false deity can’t really eliminate it because its outside its realm of power . So the serpent tempts eve, eve wakes up, adam wakes too, adam is ashamed, ? doesn’t know where it is, like ? can’t play cosmic peekaboo. cryptonite for an all powerful being?? so when one force sought to extinguish the other force, the balance was broken and Yaldabaoth freaked out.used Noah to build a boat in the desert because he wanted to eliminate gnosis.Any one with a copy of the Nag Hammadi can read all that has been said.